eBook - Making Lemonade - Facilitating disability confident & inclusive workplaces. On my tenth anniversary of living with sight loss I wrote this eBook. It is a collection of my memories and musings that I recalled as I thought back over a decade of change in my personal and professional life. It is my reflections of the ‘a-ha moments’ the daft stuff and the occasional profound moment that comes with acquiring a disability. The eBook is free to download but if you think it is worthy of payment then make a voluntary payment of your choice below. A highly personal account of sight-loss that is insightful and full of vision … puns intended (as Steph herself would appreciate). 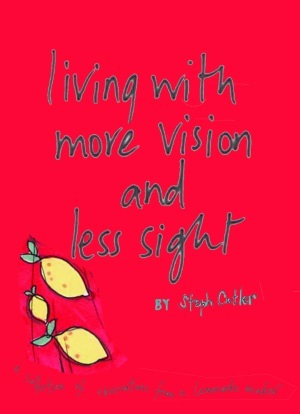 Both moving and heartfelt, Steph’s account of sight-loss challenges all the stereotypes of visual impairment and reveals how she had the vision to choose her own future as one of a life full of positive actions we can all learn from: this is a short book to inspire – not through triumph over tragedy, but empowerment over apathy. It is a rare treat to read something by someone with such vision. Witty, poignant, moving, thought provoking, educational and oh so readable. Steph Cutler has brilliantly described her journey through sight loss. This short book is a synthesis of moments, recollections and challenges that Steph faces as she makes sense of a life with limited sight. Unsentimental and at times challenging, it is well worth the read. Highly recommended. I loved this e-book! Like Steph, I became disabled as an adult and had to come to terms with it and learn how to live with it. It’s a completely different impairment to Steph’s but so many of the rollercoaster emotions are similar. Yes, there are times I hate it and would give anything to have my old life back. And yet I know that I have learned so much and become a different (and better) person because of it. I just couldn’t have described that journey anywhere near as eloquently as Steph has in this book. Read it. Disabled or non-disabled it will both entertain you and make you think. What more could one ask for?